SVP was founded in France in 1833 by Frederick Ozanam, who sought to serve the poor by following the gospel message ‘I was hungry and you gave me food to eat’. Our Patron is St.Vincent de Paul. We are part of an international Catholic organisation working in 140 countries with people in need, whatever their background, and have been in the Parish since 1930. We are always happy to have new members. Last September all of us in Year 5 became Mini Vinnies; we are the youngest members of the Holy Cross St. Vincent DePaul Conference. We begin and end all our meetings with prayers. We elected a President, Vice-President, Secretary and Treasurer. We received our Mini Vinnies badges. We’ve also been learning our special Mini Vinnies Pledge and Prayer. We have been learning about the SVP founder, Blessed Fredric Ozanam who started the Society with a group of friends in 1833 and about our Patron St. Vincent DePaul. Both continue to inspire us to follow Jesus’ teachings to be caring and loving towards others. Our Mission is to SEE - THINK – DO, so in some of our meetings we talked about how we can help others in our school, Parish and wider community. We’ve discussed many ideas and had a very busy autumn term putting some of them into action. For our school Harvest Festival we appealed for and collected lots of food items. 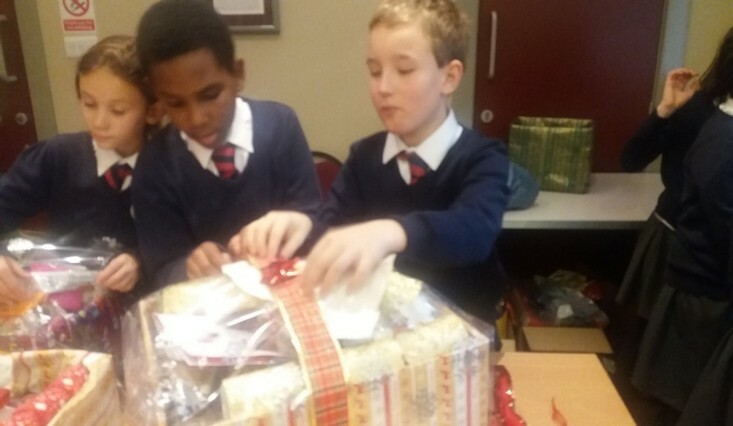 We also managed the collection of more food and toiletries as part of our Advent Charity Project. As well as our own collections we also received a generous donation of toiletries from students at Christ the King College. We put all these together made up some Pamper Packs. We also made Christmas cards for everyone. In November we made and sold our Christmas Tealights, pictures and wristbands at the Parish Fayre. From our sales were able were able to pay £141.00 to Parish funds. This is the first time we have had our own table sale in the Parish and we hope this will continue. 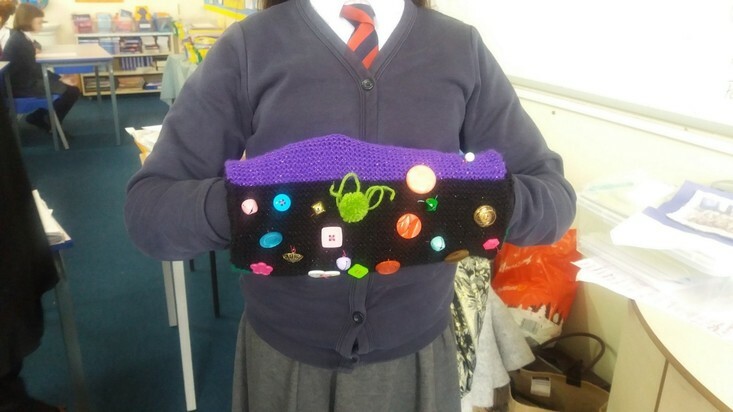 This term we have started our Knitting Project. Most of us are new knitters so it is taking us a while to get the hang of it. Our families and teachers are helping us to learn. Our focus this year is to produce TWIDDLEMUFFS for the Parish Dementia Project. We have appealed to our families for donations of wool and yarn and we are collecting safe items we can add to create lots of interesting textures and embellishments. On March 6th 2018 we had our very special Commissioning when we were formally welcomed into the SVP family and presented with our Certificates. In the summer term we will be serving as Playground Stewards, befriending children who appear to be sad, upset or lonely during play times; helping to resolve any arguments by encouraging listening and forgiveness. We are also planning more fund raising events for this summer. 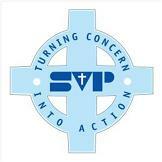 We continue to support and help out at SVP fundraising coffee mornings during the year. In this way we can continue to show how we live our Mini Vinnies Mission to SEE- THINK & DO.